A Total Waste of Blog: Jordan Jefferson As A Punter? Terrible, But Funny. Jordan Jefferson As A Punter? Terrible, But Funny. Found this on The Sports Grid, and while it took me a second, I got it. I must be losing my touch. Yep, a caller (LSU fan? Who knows? Doesn't matter.) called up Les Miles' radio program and asked him if he was thinking about moving Jordan Jefferson to punter. Does this happen anywhere else in the country? Got a question for Les? If anyone in a position of power still thinks that a live call-in show with Les Miles is a good idea, they'd have to explain it to me. But what a great weekly bit it would be for Deadspin or Outkick the Coverage: "What Will We Ask Les This Week?" Readers send in their suggestions, and one of the folks from those sites calls up Coach and lays it on him. The public wants to know, after all. In fact, let's do it. I'm loosely affiliated with the guys at OKTC - so I can pass along any suggestions. 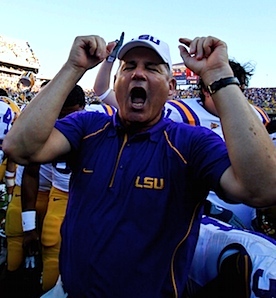 Hit me up on the Facebook page or at Twitter: @harry_long with what you would want to ask Les Miles each week.